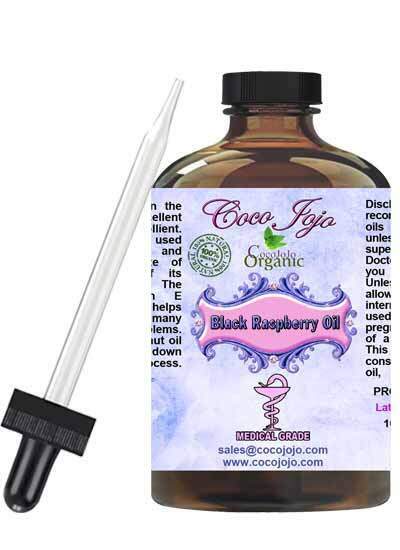 Black Raspberry Seed Oil 100% Pure Pharmaceutical Grade is Unrefined, which means it is in the purest form that it can possibly be in. 100% pure. Unrefined. Cold pressed. Natural. Vegan. Easily absorbed. Highly moisturizing. Lightweight. Light fresh scent. Paraben-free. Sulfate-free. Colorant-free. Not tested on animals. No additives. No preservatives. Bottled in the USA. Our black raspberry seed oil is rich in antioxidant activity, including both tocopherols and tocotrienols. The tocopherols are primarily the alpha and gamma type, and are superior free radical scavengers.